Asalamu Alaikum readers today I’m writing about beautiful Islamic birthday wishes & quotes for Muslim with pictures. Before you check out beautiful Islamic birthday greetings. I just need to clear a few things. Wishing or celebrating Birthday in Islam is a quite sensitive topic, Some Ulma & Muftis say its prohibited in Islam. while other allow celebrating a birthday but without doing anything Haram. like extrovert and useless things in celebration. Then question raise how to celebrate? Well, birthday simply means we’re getting closer to death. So it should be a reminder for all of us. Whoever is going to celebrate his birthday must look back his whole and think what he has done for Jannah & Allah (Subhanahu Wa Ta’ala) and what he could have done if he was on the proper way of Islam. One must regret about his past moment which he spent without remembrance of Allah. 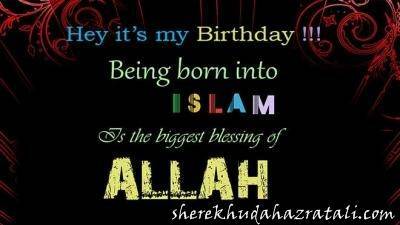 I’m not so religious but I think if any Muslim want to celebrate his birthday or wishes to arrange a surprise. birthday party for his beloved one then he must do something virtue something which pleases Allah (Subhanahu Wa Ta’ala). Keep your last year activities in your mind and imagine if you had died would you be in Jannah (Heaven) or Jahannum (Hell)? How Should A Muslim Celebrate His Birthday? Visit poor families and celebrate your birthday with them. Feed homeless people some cake, ask them to make some duas for you. Do never forget to thank Allah for everything you have and you do not have. Do list down sins you mostly committed in last year ask forgiveness from Allah and make sure not to commit them in future. Plan some good deeds do them regularly if possible. Perform Nawafils and make duas as much as you can. Note: These are not Islamic way to celebrate a birthday, But good ways to celebrate a birthday for Muslims. 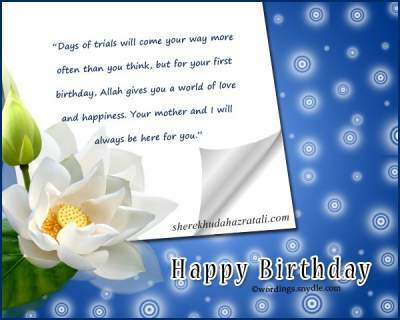 In this section, you are going to explore the beautiful Islamic birthday wishes messages. You can send these messages over the Internet or phone to wish your friends, family or co-workers. Hey, it’s my birthday!!! being born into Islam is the biggest blessing of Allah. Today, I pray to Allah to bless you with all the love and luck in this world. Happy Birthday! May Allah shower good luck from up above the heaven and make you the luckiest in this world. Happy Birthday, dear! May the Almighty Allah showers you with more success and the glorious years as you enter your new year. Wishing you happy birthday. May Allah bless you with endless moments of love on this special day of yours; this is my prayer for you for today and every day. I love you! Happy Birthday! May Allah fill your life with endless happy moments, countless wonderful surprises, and infinite success! Happy birthday dear friend. May Allah bless you with a long life! this is my sincere prayer to Allah on your birthday. Happy Birthday! May Allah bless you with a healthy and happy life. May your All wishes come true. The can be my honest prayer to Allah on your birthday. Happy Birthday, Dear! For all your support, love and care, I can only pray that Allah blesses you according to your heart desires. Happy birthday to you, my friend of life. You have a long journey ahead of you. Allah gives you strength, patience and temperance this special day to help you keep going on your mission to make a better world. Moments filled with happiness and surprises as wonderful as you can ever dream is my wish to you on your birthday. Allah will fill your life with unending victories. Allah loves you a lot. That is why he has blessed you with another year to live, to love and to enjoy! Happy birthday! Allah is great. He is the creator of everything. On your birthday, sincerely thank Allah, for giving this beautiful life to you. Allah has added another year of blessings and joy to your life because you are that deserving of a person. I wish you a happy birthday. As you blow your birthday candles tonight, I will silently pray to Allah to turn all your dreams into reality. Happy Birthday! Here comes another birthday gifted to you by Allah. Today is the day when a star was born on the earth. Many happy returns of this day! Have a grand birthday! This is the best day to thank Allah for sending you into our lives. You are a blessing. Happy birthday! Birthday is the beginning of a new year of your life. I hope Allah sends his angles to care and guide you in the coming years ahead. Happy birthday! I pray to Allah to add more days to your life so that we get to spend more time together. You are truly special to me. Happy Birthday! My wish for you today is every single day filled with untold merriment. Happy birthday to you, dear. So many wishes, So many smiles too many memories too few words with one big birthday happy birthday. Patience and wisdom are two elements to live a happy and prosperous life. On this special day of yours, May Allah bless you with these two elements that are essential for a joyful life. I wish a happy life ahead!! Happy Birthday. Days of trials will come your way more often than you think, but for your first birthday, Allah gives you a world of love and happiness. Your mother and I will always be here for you. Wishing that Allah always bless your family with smiles, happiness, and togetherness. Birthday is a special day to thank Allah for the beautiful gift which he has given to us. A gift of life!! Treasure it, respect it and love it. Happy Birthday. Birthdays are meant to forget the past and welcome the future with a new zeal. Embrace this coming year and may Allah show you the way to great success. Wishing you a very happy birthday. With Allah’s generosity and divine grace, I feel really lucky that he has someone so sweet and adorable like you in my life Happy Birthday. With Allah’s grace, you have completed one more year of your life. And I pray to him that may this New Year bring new joy and happiness in your life. Wish you a very prosperous and pious birthday. With Allah’s kindness & elegance, I truly feel privileged to have the best father/mother/wife/husband in the whole world. May Allah bless you a long healthy life. I wish you a sweet happy birthday! As you celebrate today, may Allah grant you reasons to celebrate all the days of your life. Happy birthday to you. Never once have I doubted Allah, because he has given me the world greatest father. I wish for your day to be filled with joy and wisdom and more life. Happy Birthday my dearest Daughter, Its proud to be a parent of such a great blessing. Happy Birthday, Sister. wishing you happy & prosperous years ahead of you. May Allah bless you forever & always :) & well of course. stay fabulous! I know that Allah only creates good things because he has given the world a precious gift of creating you and sharing your love with everyone. Happy birthday! Allah really loves me, as he has blessed me with a husband like you! hope he adds more and more years of joy in your life so that I can spend more and more years with you! Happy Birthday, Honey. Sending your way, Beautiful and heartfelt wishes, On this special occasion of your birthday! May Allah always bless you. Happy Birthday! I am so thankful to mighty Allah for blessing me with a friend like you! Happy Birthday to you my dear friend. Allah is truly great to have sent a wonderful friend like you to all of us. I pray that this special day will be filled with good and happy moments. As you blow the candles tonight, I silently make a wish to Allah, To guide you all your life, And to care take of you every time! Happy Birthday, Sweet Heart! I am thankful to Allah, For blessing me with a friend/lover/sibling like you! Your birthday is really a special day for me. Happy Birthday! Another year has come and gone & it’s your birthday once again. May Allah bless you with health, wealth, and pleasure! All the best for your future!. Happy birthday!! Stay blessed & have a splendid day! Let us celebrate the day when you came into this world and thank Allah for bringing us together every year to laud your birthday. Wishing you the best of life in coming years. I can never thank you enough for what you so profusely gave me all those years. May Allah bless you with peace and happiness. Happy Birthday to you! On behalf of every person you’ve been kind to, I wish you another year of Allah’s graciousness. Happy birthday to you from us. I wish that Allah will guide you every step of the way not only today as you celebrate your birthday, but every day of your life. Happy Birthday! 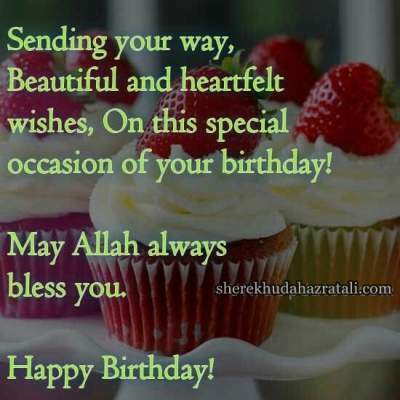 I hope that you have enjoyed and loved all these Islamic birthday wishes and greeting quotes to share with your desired person on their most joys day and shower them with Islamic birthday duas. 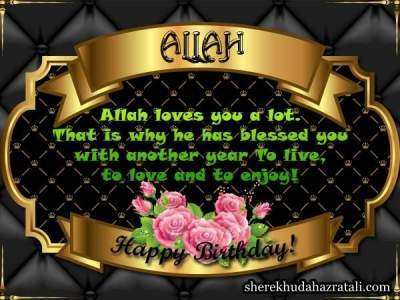 Here, you are going to explore the best islamic birthday wishes or muslim birthday wishes, greetings, cards, messages, duas (prayers) and quotes with images for muslim. You can send these beautiful birthday wishes to your near and dear ones.